Women in Greece had to struggle for many years to vote and be elected in parliament. The woman who initiated the struggle of Greek women to earn equal rights was named the first feminist in the country, Kallirhoe Parren (1861–1940). Establishing the first newspaper for women, Efimeris ton Kyrion (Women’s Journal) in 1887, Parren essentially launched the feminist movement in Greece. The first Greek feminist worked closely with European and American women’s movements for equal rights for female citizens, including the right to vote. Before 1930, the idea of Greek women voting was derided and in the newspapers of the time editorials spoke sarcastically against the right of women to vote. The notion of a woman casting a ballot was considered dangerous and to be avoided. The main argument against the right to vote was that women were hysterical, illogical and unpredictable when they had their period and since the menstrual cycle of all Greek women did not coincide, “what would the election date be?” as one editor wrote. In 1930, Greek women were given the right to vote, but under two conditions: They had to be older than 30 years and they should have finished grade school. The latter was a privilege that few women had at the time. In the rest of Europe, women in Finland were granted the right to vote in 1906, in Norway in 1917, in Germany in 1919, in Britain in 1928. 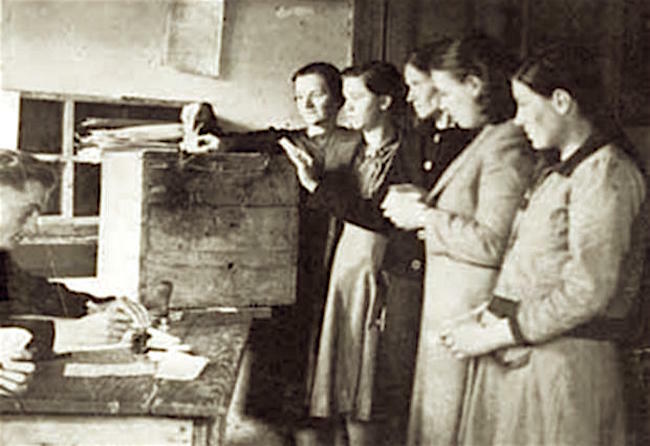 The first time that Greek women exercised their right to vote was in the municipal elections of February 11, 1934. However, in the Athens voter catalogs had only 2,655 ladies registered and only 439 of them actually went to the polls. At the time, for many women of higher social class it was considered unladylike to vote. Prominent actress Marika Kotopouli did not want to vote because – as she was saying – voting was only for ugly women and those who did not want to bear children. It was after World War II and the Greek Civil War that the issue of women’s rights was discussed again. Finally, the right for all women to vote in the parliamentary elections and the right to be elected was granted in May 28, 1952. However, women did not go to the polls in November that year because the voter catalogs were not updated. In 1953, in a repeat election in Thessaloniki, the first female deputy was elected. It was Eleni Skoura of the Hellenic Alert party, who, along with Virginia Zanna of the Liberal Party, were the first women candidates for the parliamentary post. In the next election on February 19, 1956, Lina Tsaldari of the National Radical Union (ERE) and Vaso Thanasekou of the Democratic Union managed to be elected to the House. Lina Tsaldari became the first female minister to take over the Ministry of Social Welfare in the Constantin Karamanlis government. In the same year the first female mayor, Maria Desylla, was elected in Corfu. The Greek women’s movement achieved its greatest victory when the principle of gender equality was established in the 1975 Constitution. Today, the number of female deputies has increased significantly. A total of 68 women were elected in the January 2015 House, a record for female representation. Today, there are 54 women in the Greek Parliament.